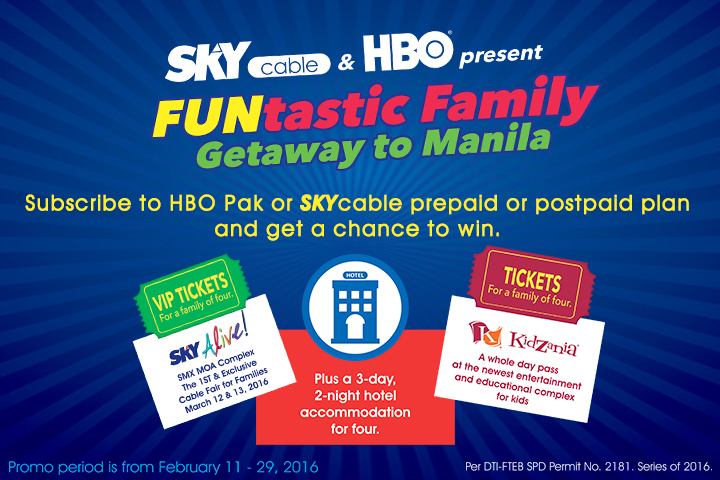 Ketchup The Latest: Sky Brings the Biggest Family Cable Fair This March! Sky Brings the Biggest Family Cable Fair This March! Sky Cable Corporation is set to culminate its 25th anniversary through a grand cable fair made for Filipino families that will feature a roster of the most popular cable TV characters and programs worldwide coming to life on March 12 and 13. Touted as SKY's first and biggest experiential cable fair in the country for families, “SKY Alive!” brings together some of the world’s highly in demand programming networks to showcase an interactive display of content, ranging from well-loved hits to the latest season of top-rating shows. “Sky has always provided Filipino families with superior content experiences. ’Sky Alive!,’ the first ever cable fair for families, will give everyone a chance to experience the world of their favorite cable TV programs and characters,” said March S. Ventosa, Chief Operating Officer of Sky Cable Corporation. ABS-CBN President and CEO Carlo L. Katigbak believes that ‘SKY Alive!’ embodies the shared vision of ABS-CBN and SKY. The line-up of ‘SKY Alive!’ will include a slew of the best entertainment coming from ABS-CBN HD, ABS-CBN Cable Channels, HBO, FOX, AXN, Discovery Channel, History Channel, Cartoon Network, and RTL CBS Entertainment among others. The theme park-inspired cable fair will be divided into several zones composed of the different participating channels, reflecting SKY's complete and rich channel line-up suited for every family member. The zones will showcase interactive games and surprises from genres spanning from entertainment, sports and action, lifestyle, and all the way to learning and news. Families also have the chance to meet and greet their favorite celebrities, join kid-friendly art sessions, take selfies with mascots and cosplayers, take part in interactive games, sit on the “Game of Thrones’” iconic iron throne, and a whole lot more. In partnership with HBO, provincial subscribers of SKYcable can also become part of the country’s biggest experiential cable fair. One family per region (Luzon, Visayas, and Mindanao) can win a trip for four (4) to Manila to enjoy “SKY Alive!” and bond at Kidzania, an indoor play city where kids can have fun exploring the adult world. 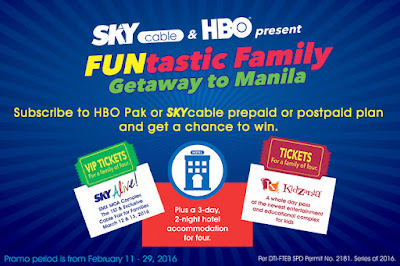 To join the “FUNtastic Family Getaway to Manila” promo, existing SKYcable postpaid subscribers just need to add HBO (1 raffle entry) or HBO Pak (2 raffle entries) to their basic plan to qualify. Meanwhile for new subscribers, an installation of one prepaid cable (2 raffle entries) or an installation of postpaid cable of any plan (3 raffle entries) can entitle them to raffle entries. The promo runs until February 29. “SKY Alive!” is open to the public on March 12 and 13 at Mall of Asia’s SMX Convention Center in Pasay City. The event is free for all SKY subscribers (two free tickets per active subscriber account), while non-SKY subscribers or SKY subscribers who want to purchase more can avail of tickets priced at P200 per person available at the event’s registration booth or online via the ABS-CBN Online Store. For 25 years, SKY as a cable TV unit of ABS-CBN has established itself as a pioneering leader in digital cable TV, offering unmatched entertainment and constantly innovating to provide the best experience to its valued subscribers. SKY subscribers should look forward to better and brighter things as SKY continues to bring world-class, accessible entertainment to every Filipino home in the future. For more details on “Sky Alive!” and the promo, visit mysky.com.ph/skyalive.